The wooden beds have natural and classic look and many people like to select a wood bed for their bedroom. 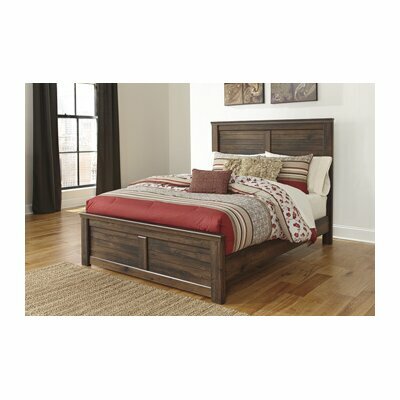 The wood king beds have many styles and designs depending on your room style and choice. Contemporary and rustic style of this elegant Elsa Platform Bed will adorn the beauty of your bedroom. 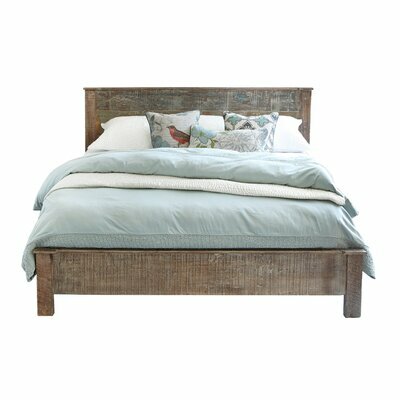 Constructed from acacia wood, this panel bed features a distressed look with lime wash finish and lead free lacquer sealant. The bed frame is sturdy and comes with a middle beam for extra support and stability. This bed can also be used as a platform bed. The color, distressing and carvings on the bed may vary from piece to piece. Lead free lacquer sealant is applied on. Middle beam is included for extra support. Box spring is not needed with this bed. Available in California king size, king size and queen size bed. Graceful Chelsea Park Panel Bed by angelo:HOME features a high headboard so you can lay your back against it while reading or watching your favorite movie. Sturdy construction with distressed look and warm golden to medium brown color in macchiato finish makes this bed an excellent choice. Manufactured from Sengon Tekik, a fast growing Javanese hardwood. Hand applied 8 step finish. Warm golden to medium brown. Kiln dried wood adds strength and lasting beauty. Bed features frame and panel construction, dowel joinery, and tongue and groove joinery for structural strength and integrity. Metal to metal rail fittings make assembly and reassembly easy and renders long term durability. Includes headboard, footboard, bed rails, slats and 1 center support leg. Bed rails are made from hardwood veneer and hardwood plywood. Cross slats are made from hardwood plywood. Adjustable center support leg adds stability on uneven floor. Low profile 4-5″ box spring is recommended (not included). Please remember that natural wood must breathe and is affected by environmental conditions. Expect shrinkage, expansion or plank movement over time. These are normal occurrences and will not affect the structural integrity of the bed. Available in 4 different sizes, including California king size, king size, queen size and full size. The Brecon Panel Bed is apt for any bedroom setting. Manufactured from mahogany solids and veneers, the bed frame is sturdy and long-lasting. The Brecon Panel Bed features a distressed antique white finish that will adorn the elegance of your bedroom for a romantic rendezvous every evening. Offers both king and queen size beds. Flattop Panel Bed features a contemporary and rustic style bed in dark brown vintage finish that adds elegance and beauty to your bedroom décor. This gorgeous panel bed is assembled in United States of America with global components for a perfect chic and clean look. This bed is assembled in United States of America with global components. Bed includes headboard and footboard. Slats included for supporting mattress. Requires box spring but does not included with the bed. Low profile box spring is recommended. Available in king size and queen size only. Comes with 1 year limited manufacturer’s warranty. Tilton Panel Bed with Storage by Birch Lane features 4 built-in storage drawers for stashing extra bedding materials like bed sheets and pillow cases, your kid’s toys or out-of-season clothing. The paneled headboard and footboard are topped with crown molding that gives this stunning bed a perfectly finished look. The brushed nickel cup pulls on the drawers complement the crisp white finish of this panel bed. Constructed from hardwood solids and select hardwood veneers. Headboard and footboard is included. Pocket friendly bed as box spring is not required. Comes with total 4 built-in drawers, 2 on each side for storage purpose. Bayfield Panel Bed by Samuel Lawrence features a sturdy and robust bed frame manufactured from hardwood solids and birch veneers. This stunningly elegant bed features a graceful sienna finish that adds appeal to its medium brown color. The bed frame comes with 4 slats that supports and stabilize the mattress and removable support beams that ensure structural stability. Samuel Lawrence Bayfield Panel Bed offers multiple sizes to choose from with 1 year limited product warranty. Constructed from hardwood solids and birch veneers. Sienna finish with medium brown color. Bed features angle cut legs. Removable support beams ensure structural stability. Headboard, footboard and slats are included with the bed. 4 slats support and stabilize mattress. Box spring is essential but doesn’t come with it. Available in 3 sizes (California king size, king size and queen size). Kingstown Sovereign Four Poster Bed Collection. Manufactured from mahonie solids and American black veneers. Finished and sanded in multiple stages for a well-loved antique and attractive distressed look. Solid brass hardware is custom-designed and finished in an aged bronze with copper undertone. Low post footboard gives a unique look. Maximum weight capacity is lbs. 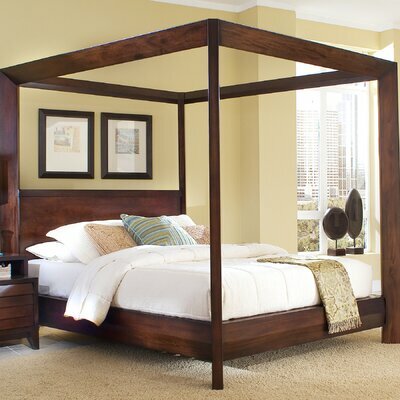 Elegantly designed Island Chamfer Canopy Bed by Home Image features strong and robust bed frame made from hardwoods and selected hardwood veneers with a canopy. This gorgeous canopy bed comes in brown color with light red undertones and attractive mocha finish that enhances the elegance of the bed. Manufactured from tropical hardwoods and selected hardwood veneers. Warm and attractive mocha finish. Brown color with light red undertones. Headboard, footboard, slats and center support included with the bed. 3 slats ensure adequate support to the mattress. Mattress sits snugly on top of bed platform (mattress not included). 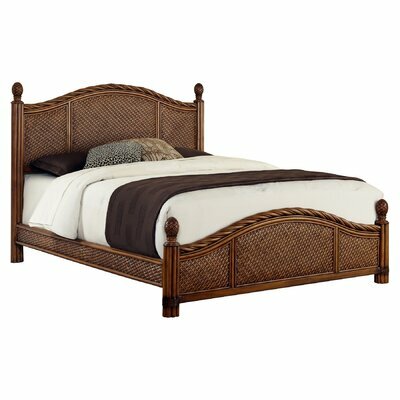 Naugatuck Panel Bed displays a rich blend of materials including natural rattan woven wicker, mahogany solids, and veneers that renders sturdiness to the bed. This appealing bed features intricate basket woven rattan panels and beautifully carved pineapple finials in refined cinnamon finish that adds charm to your bedroom décor. Headboard and footboard of this paned bed comes with interior padding for additional comfort. Manufactured from rattan and mahogany solids. Finish: Refined cinnamon (this bed). Solid mahogany bed posts features beautifully carved pineapple finials. Intricate basket woven rattan panels on all four sides of bed. Leather wrapped strapping on the posts of footboard. 3 slats included to provide adequate support to mattress. Requires box spring (not included). Other Side Rail Length: 82" Side Rail Length: 82"
Light cream color of the Placid Cove Louver Panel Bed by Riverside Furniture exudes an air of freshness. Poplar hardwood solid and poplar veneers renders robustness and strength to the structure of this attractive bed. Sophisticated look of the Placid Cove Louver Panel Bed will adorn the elegance of your bedroom décor. Placid Cove Louver Bed Collection. Constructed from poplar hardwood solid and poplar veneers. Available sizes are California king size, king size and queen size.